Hey guys! Today I wanted to share a highly requested un-makeup tutorial. I'm talking about makeup removal. When we first adventured into the world of makeup, many of us got stuck knee-deep with this daunting task with nobody explaining how the heck to get it off again! Waterproof makeup is, in fact, waterproof thus causing fits of eye-rubbing and exasperated sighs as tan foundation decides to lovingly transfer to your favorite white towel. Eyes became sullen, not just from the sadness of it all but also because that eyeliner decided to migrate from your lash line to your eye bags regardless of how much face wash you used. Worry not, dear readers! 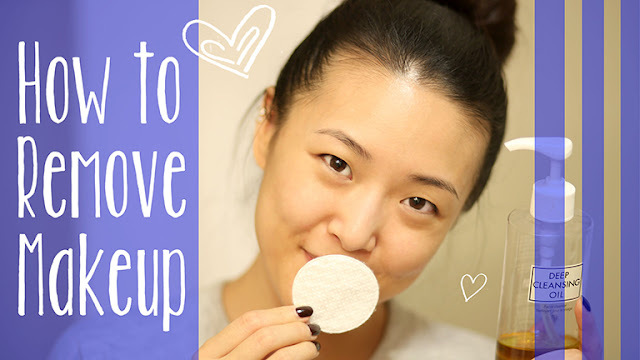 I have a fail-proof makeup removal routine that will literally get your face squeaky clean that works on everything from everyday makeup to the heaviest of stage and costume makeup (aka club night). First of all, let's talk about eye makeup removers. If you are a user of waterproof eye makeup on the reg' like I am, you are going to want an oil-based remover to break down the hydrophobic part of your mascara and eyeliner as well as lipstick. Look for a 2-part oil-and-water remover like Lancome Bi-Facil, Clinique Take The Day Off, or NYX Eye and Lip Makeup Remover. I haven't personally tried it but I know Maybelline has a new dual-phase remover that is similar and affordable as well. You shake the two parts together and make magic happen on your sexiest body part. That's right, your eyes. That's what you were thinking, right? Seriously though, a bit of this on a cotton pad and even your strongest waterproof mascara doesn't stand a chance. For foundation, I love a good oil cleanser like DHC Deep Cleansing Oil. I've used this for years and on lazy days I use this on eye makeup as well as face even though it tends to leave an uncomfortable residue in my eyes. Just use a pump or two and massage into dry skin, then emulsify with water and rinse clean. If you aren't particularly acne-prone like me, you can even use this as a 1-step cleanser alone. I personally follow up the oil-cleansing step with my regular face wash to make sure every bit of makeup and oil is completely gone. Conversely, if I am just using mineral makeup or powder foundation I go for the eye makeup remover + regular face wash since they aren't as waterproof as liquid foundations. You can easily mix and match to fit however much makeup you are wearing that day! In case you are interested in my full skincare routine check out this post. Thanks so much for reading and I hope this was helpful for you guys wanting to get a completely clean face before bed! Readers, do you have any makeup removal tips? What are your favorite products to take off your makeup face? Let me know in the comments! My routine is pretty much the same: dual phase waterproof eye makeup remover, oil cleanser, and then face wash! Just to be pedantic, most dual phase makeup removers are actually oil free -- the non-water phase is usually mostly volatile silicones like cyclohexasiloxane. Anyway, I LOOOOVE the newish Maybelline one (Clean Express Waterproof Makeup Remover) -- it costs less than $5, works as well as any dual phase remover I've ever used, and doesn't burn my eyes at all. My local drugstores were out of stock for a while and I used Neutrogena and Lumene versions as a stopgap, but both irritated my eye area too much. Folks with sensitive skin should definitely give the Maybelline version a shot. I ought to try the Lancome bi-facia then! I've been meaning to try the Shu Cleansing Oils but never got around to it since I still need to use up my DHC one. I'll try it next! if you've tried the shu cleansing oil. let us know how does u feel. thanks jen! I always use bioderma to take off my make up-- I have pretty sensitive skin and it doesn't irritate or dry out my face at all! coconut oil! it's the best :) it removes waterproof mascara and eyeliner like nobody's business and leaves your skin feeling soft and moisturized; your eyelashes feel conditioned and it's so cheap compared to actual makeup removers. what more could you want? Great minds think alike! Bi-Facil is absolutely my favorite for removing waterproof mascara. I've been using DHC Cleansing Oil for years and LOVE it! I've tried MAC's version and Bobbi Brown's version of cleansing oil, but they don't remove makeup as well as DHC. So glad to see you are using the same things I love. Great products! Another bonus, I like to use DHC Cleansing Oil to clean the brush I use for my gel eyeliner. It works great! Jen!! Is it bad to remove eye makeup with the cleansing oil? I'm usually too lazy to do the extra step of using eye makeup remover.. I use coconut oil to remove all my makeup. Then I rub a warm washcloth on my face. Am I the only one? I'm currently using Biore Hydra-Clear Makeup Remover! I like it a lot. I also use L'oreal eye & lip makeup remover.. don't really love it but I got it on sale. lol. I'm trying to finish that to try Innisfree's apple juicy lip & eye remover! I've heard a lot of good things about it! I just went through a bottle of SK-II's makeup cleaning oil, which were quite good. It did not irritate my sensitive skin or eyes and removed my makeup thoroughly, leaving the skin feeling supple and smooth. I still like to finish my last cleansing step with my clarisonic + face wash. Now I am trying out FANCL's cleansing oil. It is a cheaper alternative and does not contain preservatives, so a bottle is meant to be used up within 3 months or less. I also have a bottle of Shu Uemura fresh pore clarifying gentle cleansing oil that is waiting to be used next. 2. Rinse face with warm water. From other reviews, I then massage my face with the cleanser for 30-60 seconds. Skin feels nice not tight.I am 40+ and everyone says I look 30 ! DIY Remove Glitter Polish FAST & EASY!!! December Favorites & A New Year!